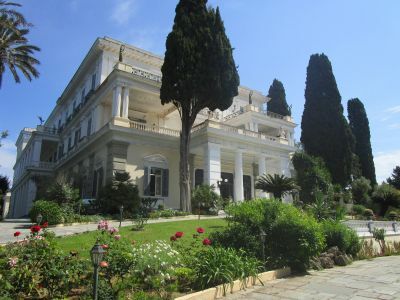 The Achilleion Palace, build by the order of Empress Elisabeth of Austria, is located on the beautiful Greek Island Corfu. Sisi named the palace after her all time hero Achilles, a greek Mythological half god that we know from the Troyan war. 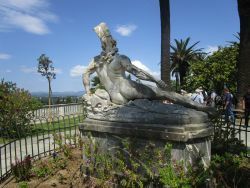 A statue of him can be found in the gardens of the palace. 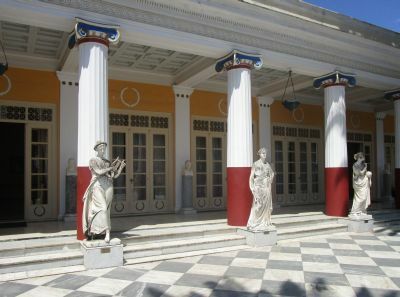 Greek Mythology is the main theme all around the estate. I totally understand why Empress Sisi adored this Island; the weather, the views, the food, the people, all wonderful! 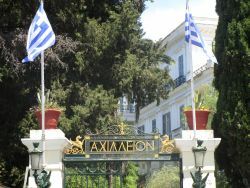 When you are on vacation on the lovely island of Corfu and have a few hours to spend, I strongly recommend taking a tour to this lovely palace! 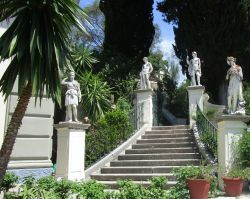 The Palace is located on a hill near the little village of Gastouri, and has great views over the surrounding hills, the sea and Kerkyra (Corfu city) in the distance. 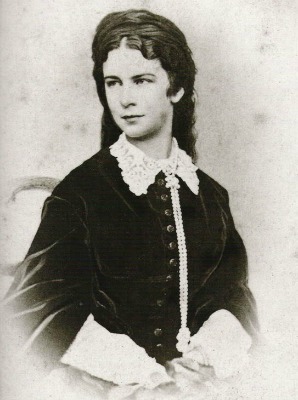 Sisi (or in fact Franz-Joseph) bought all the surrounding land that leads down to the sea, to give her access to the estate when arriving by boat. The Italian architect Raffaele Caritto did a wonderful job designing a lovely little palace in honour to the Greek hero Achilles. Ernst Herter, a German sculptor, created numerous works inspired from Greek mythology, the center piece being “The Wounded Achilles”. Sisi placed this statue on the most prominent place in her garden. On the terrace, in the garden and on the balconies and roof, everywhere you see beautiful statues that depict centaurs, Muses holding torches, Greek Gods and even a Greek courtesan from the 4th century BC. Sisi had a great interest in, and admiration for Greek history, culture and mythology, and she studied both the ancient Greek and new Greek language, which she spoke fluently. The palace was built between 1889-1891. Sisi would visit the place frequently in the years to come, to relieve her from the depressions that followed after the dead of her only son. On January 30, 1889 Crown Prince Rudolf killed his misstress and took his own life. Sisi spent the time reading and studying, hiked and roamed the Island on horseback. There are not many rooms to visit within the palace, but the ones that are open to the public are as beautiful as the outside and gardens. 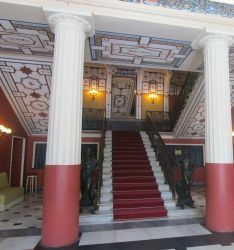 The main entrance hall and staircases are magnificent, with beatiful paintings, fresco’s in wonderful colours and and statues everywhere. The litte chapel is lovely too, and there are some interesting artifacts on display that used to belong to the owners of the palace, empress Elisabeth and Emperor William II. Some interesting anecdotes: The hands are removed from all the clocks that are displayed in the Achilleion. Empress Sisi did not want to be reminded of the time passing, and neither did she want to live according to a strict timetable. 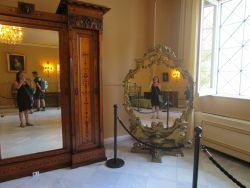 In Sisi’s bedroom the large mirror cracked during her last stay there, and she predicted to her lady-waiting that this would be the last time she visited the island of Corfu. 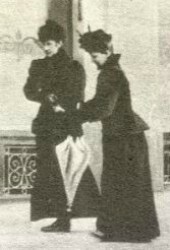 She prooved to be right, she was assassinated by Luigi Luccheni in 1898. When on Corfu Sisi could relax and did not have to obey the strict protocol that rules the court. 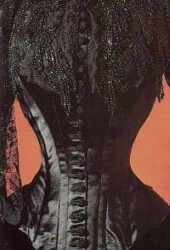 You can see that in the way she dressed, she had a special wardrobe that she only wore there. You can read about the Corfu dresses here. The cracked mirror in the bedroom of Sissi (by the way, that's me in the reflection! 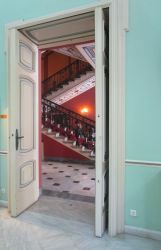 After the dead of Empress Elisabeth the Achillion Palace was left vacant for 9 years. It was finally bought by emperor William II of Germany (Kaiser Wilhelm). The first thing the Kaiser did was move the dying Achilles to a less prominent position in the garden, and replace it by a huge triumphant Achilles made of Iron and bronze. He thought this would reflect him better! 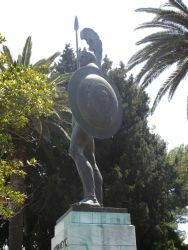 Word goes that he placed an inscription on the statue: "To the Greatest Greek from the Greatest German". This was removed after the war. He could only enjoy the palace for a couple of years, in which he would frequently visit it, until the outbreak of the First World War in 1914. During World War I, the Achilleion was used as a military hospital by French and Serbian troops. After this war the palace became property of the Greek state.